In 2003, I began making artwork about bones. I made more than 100 pieces of art, over a period of about three years, that included oil paintings, charcoal drawings, paper mache sculptures, prints, collages, plaster sculptures, wooden sculptures and works of mixed media. The research that was required for me to make these pieces enabled me to become educated about osteoporosis, a condition that I’m interested in. During this time, I was invited to participate in two exciting exhibitions hosted by the American Academy of Orthopedic Surgeons. The first exhibition, in 2008, was called, Seventy-Five Years of Orthopedic Surgery and premiered in San Francisco and then traveled to Chicago. Two works of mine were selected, United We Stand, and The Valley of Dry Bones #1 , which can be seen on my website . 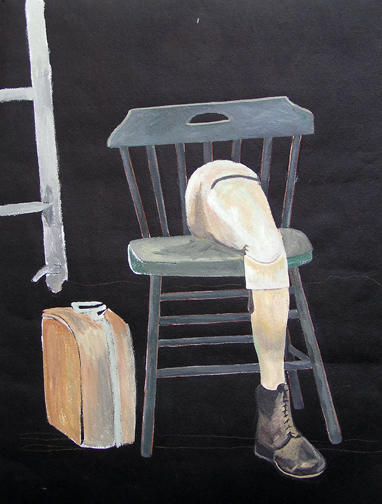 In 2010, the AAOS hosted another exhibition called, Wounded in Action. This exhibition was organized to bring awareness to the soldiers who were coming back from the war in Iraq without limbs. It was also organized to highlight the medical advancements of orthopedic procedures, treatments and prosthetics. It premiered in New Orleans and then traveled for a year to Washington D.C, Chicago, Baltimore, San Antonio and Fort Carson. For this exhibition I cast seventy-six individual pieces that were hung down a 20’ stretch of wall as an installation. 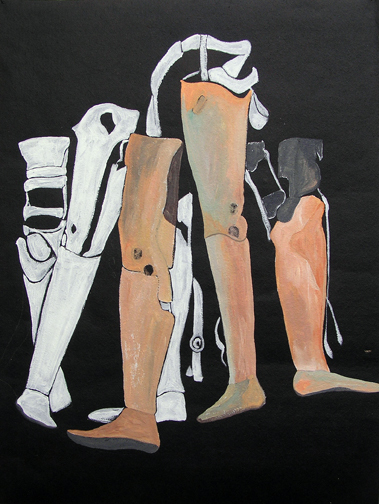 Both these exhibitions showed photographs and artifacts, some historical and some contemporary, of surgical tools used, and the prosthetics produced, mostly because of urgent needs of Americans who had given up parts of their body to the effects of war. Simultaneously, I became interested in a beloved American writer: Flannery O’Connor . When I read Good Country People, a short story about Hulga, a one-legged, intellectual, introvert who fell for a Bible thumping salesman, I immediately wanted to do some portraits of her. I was interested in painting Hulga’s portrait as simply an artificial leg. I painted a watercolor of her, a watercolor of Manly Pointer, the Bible salesman, and four large acrylic paintings on tar paper of Hulga in a variety of situations. As I painted these acrylic paintings, I began to see that the Hulga paintings were actually paintings of me. These works are titled with myself in mind as I was going through some tough years of divorce. In 2007, I was in Austria at an arts conference and I met an American who was then living in Edinburgh. We became fast friends and the following year I visited her in Scotland. Eventually she moved back to the States and settled in Boston. Have you noticed that lives have a funny way of twisting around and paths cross over and over again? Good friends can be found in the oddest of places, for me, in this instance, in a castle on top of a mountain in a faraway land. Although we haven’t stayed in contact much beyond Facebook, we do admire one another and consider each other a friend. She recently was asked to curate an exhibition for a small gallery on the Harvard campus. The exhibition was themed “Compassion” and she asked if I would submit two of the Hulga paintings. I was honored and shipped them straight away! On October 12 this exhibition opened to rave reviews and the gallery was packed! It was a joy for me to be included in this exhibition, but even more, I am in awe at the universe and how the things that we do, sometimes thinking them to be insignificant, or of no special concern, can be turned into something bigger than we ever expected. Art is a way to connect with people. Share what’s in your heart with the world and don’t be afraid of strangers. More times than not, you will be blessed beyond measure. Now you have me reading….Good Country People. Thanks again for some inspiration! And congratulations on sharing the works with a large audience. Lucky them, lucky you! Oh, yes, Wendy, you should! Flannery O’Connor’s characters are brilliantly bizarre. There’s tons and tons of metaphorical meaning. You can find gads and gads of info on the internet on her stories. After that, read “A Good Man Is Hard To Find.” Crazy weird good. For some reason, this made me think of Danita Geltner. I remember Helga from when we create your website!!! Do u still keep in touch with her? Yes, your great skill and talent afforded me a beautiful website! Anita, I think each of your writings is the best, but I have a tendency to change week to week. This particular phase of your creative ability has always fascinated me. If you think back, you will know that is true. Can you believe I never knew about Hulga? That does it, a new number one.